Culbard's cover is superb and certainly a contender for cover of the year in my book. Eminently suitable too considering the length of Brink this week; a full 10 pages of insanity. As so many have observed in this corner of the inter web, Brink has most assuredly been a highlight as it has evolved (or devolved depending on how you want to view it). 3rillers and Skip Tracer are the lowlights of the prog but even then that is only off the back of the competition. Marshall's art serves the story well but as has been observed, it is hard to invest in the characters or the events that limp gamely on. Perhaps it will hold together as a single unified piece? Maybe it would have stood a better chance had it not been run against some of the strips this week. 3rillers at least tries to move things forward but this one feels a little too compressed. There are loads of ideas in it, albeit several lifted from a Gaiman novel, but I'm not entirely certain if Jon or Adelphi is supposed to be the central character. Had Murphy been given a longer run at this it would have been interesting to see what a 10 / 12 parter would have been like. Austen's art suits it well mind which might go a long way towards explaining why it is appealing so well. Dredd though ... A Wagner / Macneil Dredd to boot! Even though there is a sense in which the outcome is inevitable there is enough here to destabilise expectations. The contrast between Randy's condescension and Harvey's respect puts Dredd's concerns in an ambiguous place. Logan's defence of the decision together with his own ambivalence make for an interesting step too, as does his reaction to Dredd's revelation. Only two episodes in and Wagner once again gives a masterclass in pacing, revelation and characterisation in the world of Dredd. Considering that this is due to run until March, forthcoming weeks look to be a real delight for us. 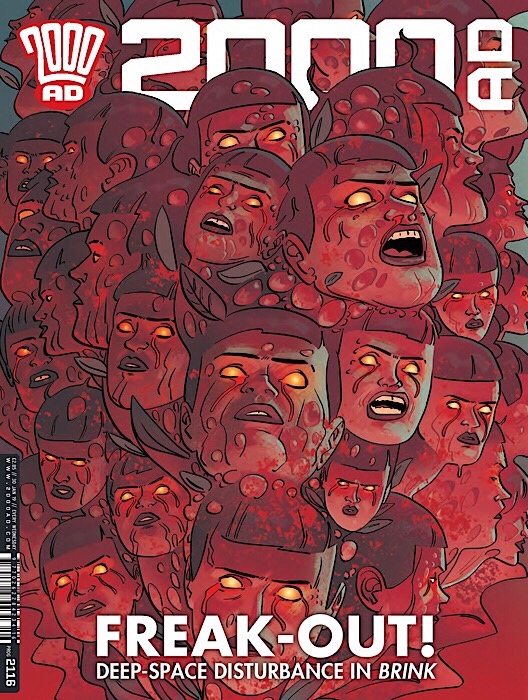 Dredd and a double-length Brink make for a stunning prog on their own. Feels like this chapter of the latter is drawing to a close -- I hope the next one is already in the works. Dredd continues to deliver the goods -- fantastic stuff. Bit of an art slip-up on Randy's badge in the first panel, though. Rarely is a Prog so straightforward to review. The quality of the strips is so polarised. 3riller is a rambling nothing and I just don't care about what's happening as I don't care about any of the characters. Skip Tracer sees Nolan continue to be angry and lack any depth and therefore again while he's acting like one of those silly hard and souless leads from the early 90s strips this series just doesn't work. The difference between this series and the second is staggering. Shame. Dredd is great, not quite the masterpiece of last week but a fantastic continuation of a fascinating story. The character I'm most interested in is a mechanised Judge... see the difference there! Brink... well that is a masterclass again. When you've had this build up, so masterfully paced, so expertly executed you worry for the set piece finale, how can it live up to that... well this drug fueled, crazied surreal nightmare conflicit is how. Just astonishing. The story isn't over but this was just wonderful. So the fact that Brink is a double header means the Prog is a win overall. Not so straight forwards review for me. I have been saying how great Brink is for weeks, and I read this first (which is unusual for me as I tend to read the Prog in order) but I don’t like it when things go all weird like this. Dredd is great, but I’m not sure how much mileage is left in the Dredd objects to the robot Judges story line. I’m much more interested in the Hershey moving on aspect. Lack of investment in the characters in a 3hriller seems to be par for the course. It matters less in a one shot Future Shock as the point is to get to the denouement; here we are meant to feel for Jon inadvertently making a deal with a demon, but that’s a plot I am sure we have all seen loads of times before. Skip Tracer continues to do a job...albeit as a “c” list strip. I read a few comments saying that Nikolai Dante started out similarly underwhelming - not sure I agree with that. Skip Tracer seemingly has all the ingredients for a good strip and maybe that’s the problem - it feels like scripting by numbers but lacks soul. Coincidentally I read an article yesterday about film scripts being written by AI. IMO You can throw all the elements in but that doesn’t mean it will be engaging. I quite like the 3riller. I don't expect these short stories to have deep, well-rounded characters, or to care about them. You can't really have all that in just 15 pages. I'm happy to just watch people floundering in a horrible predicament. I am also most interested in the Hershey/Logan side of the current Dredd story, but I don't share Magnetica's pessimism about the robots story. I have confidence that Wagner won't just do a rehash of the original robots story, and I like Harvey and want him to be ok. Brink has always been building up towards a real finale, so I'm not sure what to make about the opinion "I like Brink except for the weirdness"; it's a bit like "I like James Bond apart from all the shooting and seduction." Not sure about that...it’s perfectly possible to like something without liking every aspect of it, or indeed disliking certain aspects of it. Anyway all I meant was I don’t really like it when you see perceptions of reality distorted. And sure in this case there is a perfectly good reason for it within the plot, it’s just not my thing. But I still love Brink. BRINK comes to satisfying conclusion and leaves me wanting more. DREDD generates a whole new set of questions for me; it looks like it won't be simply robots will go wrong but more have they the right to judge which may lead to more "has anyone the right to judge?" questions. As you will be tired of reading, Skip Tracer and 3hriller suffer by comparison to these top tier thrills but I enpy both and find them perfectly good, if not great, thrills. Oh and art is a highlight throughout- I'd be more impressed with the 3hriller art if not in same prog as on fire MacNeil, Culbard and Marshall. Brink just plain brilliant, the way not only the art but the coloring complements this series has allowed this to become one of the best new thrills of recent times and will sit very conferrable in my top 3 thrills of all time. I still need to know. The weirdness in Brink, is it just drugs and psychosis? But they shared the same hallucinations - at least Gentry and Bridget both saw Joel with the Eye. And Brink... she was just on Nudge when she saw Brink, the first time, not this gas. And of course, the words. The words have power. And what happened at the Mercury Incident? I enjoy the 3Riller, I wish Mercury hadn't been all punked up tho. Wagner has been mining Dredd vs Intelligent Robots since he returned to the strip in 1977. I'm sure he'll keep finding ways to keep it going. I quite enjoy the uncertainty of what is real and what isn't. I think Culbard and Abnett are using the medium well, and taking advantage of things that wouldn't be possible to do well in prose or on film. Holy shiatsu, Brink really goes for the jugular this week. Eleven pages, including the cover, of utter sublimity. And what Dan Abnett does for nightmarish horror in his story, John Wagner matches with wit and subtlety in Dredd. Truly, two strips that stand with the very best the prog has ever offered. Actually, just a couple of points about Brink: do we reckon it was written as a 10-page installment, or is it two episodes shunted together? The 5th page ends with the large image of Brinkmann, which seems like the perfect cliffhanger; but the next page is a nine-frame montage, which doesn't look like the layout of an opening page. Also - and it seems phenomenally churlish to point this out in such a brilliantly realised installment - but is the INJ-C droid perhaps just putting a tiny bit less detail into his work..? Just thought a few of the background figures looked a bit under-drawn. Sorry. I realise the punishing deadlines that must be involved in creating such a long strip.